Improves the appearance and tone of mature skin by increasing firmness, elasticity and intense hydration. Tightenyl® (2%) is an innovative, innovative lift with clinically obvious results on skin firmness and elasticity. 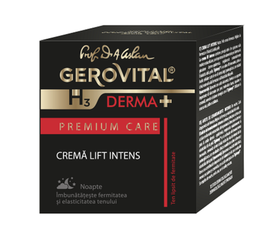 Hyaceramidyl (2%) is a complex that combines Hyaluronic Acid (low molecular weight) liposomes with Squalan and Ceramide, providing wrinkles from the inside. Hyaceramidyl in synergic action with Tightenyl®, increases skin hydration reserves and maintains an optimal level of hydration. Apply the evening, face, neck and neckline on pre-cleaned skins. Improves the firmness and elasticity of the complexion. Can the cream also be used for the fine area around the eyes? Although it is a night cream, if it is used day, are there any contraindications? The cream can also be applied to the area around your eyes. The cream helps to increase the firmness and elasticity of the skin and moisturizes intensely. It can also be tested during daytime, following the skin's reactions. If you are exposed to the sun, apply after cream and spf product. What is the concentration of hyaluronic acid? There are situations when we use several active principles to get a certain effect, but which are mutually reinforcing through action synergy. Therefore, the concentration of a single asset is sometimes not relevant. In this case low molecular weight hyaluronic acid, conditioned as liposomes, was used. Liposomes, named Hyaceramidyl, having synergistic action with Tightenyl® provide an important contribution to low molecular weight hyaluronate, scualan and ceramide, and represent the absorbable form of hyaluronate. Through their special structure, liposomes are absorbed into the skin. In this way the wrinkles are filled from the inside and smooth, and the skin becomes firmer.